The many representations of the enigmatic steed that carried Prophet Muhammad on his night journey to heaven. Many artists during Japan’s Edo period designed ukiyo-e woodblock prints, but the works of Utagawa Hirokage stand out from many of these “pictures of the floating world” for their affinity for the absurd. 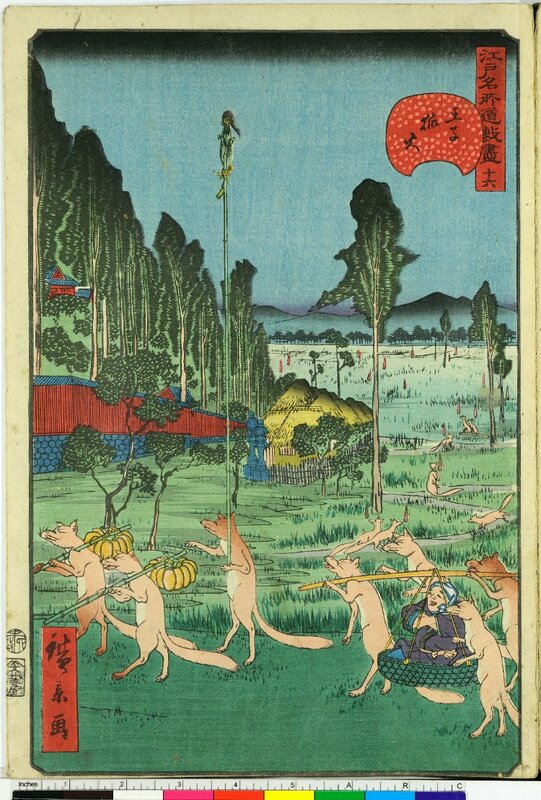 A student of the famed Utagaway Hiroshige, Hirokage is perhaps most known for an incredible triptych of a battle between fruits, vegetables, and fish — but also for a successful series he published around 1860 titled Edo meisho doke zukushi, or Joyful Events in Famous Places in Edo. The 46 images set in present-day Tokyo are simply bizarre: scenes of a tiny octopus attacking people on a beach or of foxes carrying pumpkins are so ridiculous you can’t help but chuckle. Hirokage, in a sense, was churning out the memes of his time. British Library Or.7094 is an illustrated copy of the late Ottoman Turkish poetic work, Fazıl Enderunlu’s Zenanname (ʻBook of Womenʼ), which describes the positive and negative qualities of the women of the world along with satirical and moralistic parts at the end. The text is a poem in mesnevi form that was completed in 1793. I became interested in this work because typologies of women began to appear in Mughal and Safavid poetry and painting in the seventeenth and eighteenth centuries and there was the possibility of doing comparative scholarship across Persianate cultures. The Thomists (e.g., Feser, SM 3.1.1, 177-8), when establishing hylomorphism – the doctrine that a body is composed of prime matter (hayula) and form – favour, following Aristotle, a line of argument which proceeds from change.